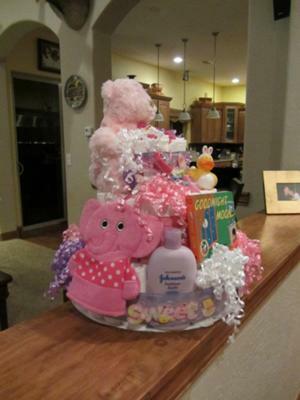 This is a little pricey diaper cake. All together I spent about $120. for materials. I used 130 #1 diapers. 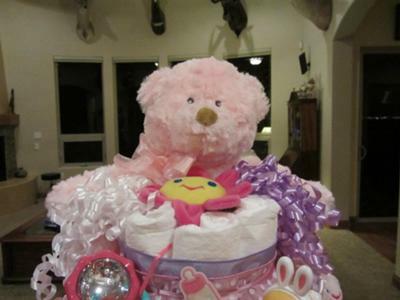 The topper was a special bear that made soothing sounds. I used a Nuk baby bottle and snack containers that I got from the dollar store for the center. 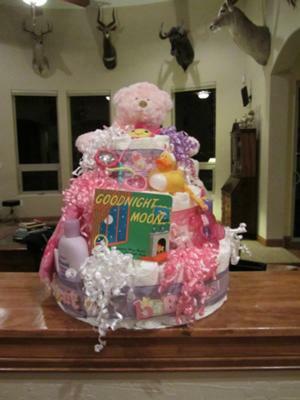 This cake had so many diapers I used three wooden dowels to keep the cake together. The ribbon and curly ribbon came from the dollar store. My friend wanted to use full size bottles of shampoo, lotion and Baby wash so I took a couple of diapers out and replaced with the bottles.